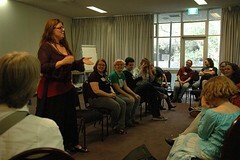 BarCamp Sydney: Best way to start off a life in Sydney? So, I just arrived in Sydney 4 days ago, on a fateful Tuesday morning. Since then, I've moved into an apartment with a fellow Googler), learned how to hang laundry out to dry, hung out with the Sys-Ops crew in the office until 3 am after getting kicked out of the Bungalow8 bar, and today, participated in BarCamp Sydney. BarCamp Sydney started off with a debate about rolling your own CMS versus modifying a pre-existing one, which is really the eternal debate about rolling your own anything versus using pre-existing anythings, so it triggered a lot of discussion and a counter-session later. This was a good indication of the sessions to come: a technical topic with an opinionated audience. I myself gave two different sessions during the day. The first was a code walkthrough of a simple App Engine app, showing off the various features of GAE (and I might have thrown in a few <blink> tags). You can download that code in a ZIP, or just read through it in the "Getting Started" documentation. The second was a brief description of HTML5 with as many demos as I could fit in 20 minutes (just got through video and forms), and it was based on the talk I gave at FOSSmy last weekend. You can see the slides here, and download the demos here. 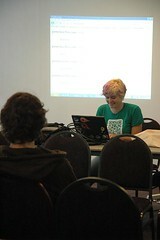 Both talks seemed to go well, and I got a few compliments on presentation style after. As far as I've figured out, my presentation style is high energy plus demo plus explanation (= keep them awake, wow them, teach them). After all the talks, we all enjoyed free drinks in a bar just for us, and then a bunch of us went to dinner at a nearby Italian place. There, I experienced the amazingness that is oysters+bacon and oyster+cheese. Omg, I never thought to put oysters plus melty cheese and white sauce together, but it is a cheesy seafood heaven in your mouth. We finished the meal by drawing naughty doodles on the tablemat and surrounding them with HTML tags (my use of <table> tags was finally justified). All pics here were taken by Halans, one of the unorganizers of the conference. For some reason I feel uncomfortable making statements like "I'd like to be your friend" in person so instead I tweet reminders to myself to take note of your polished presentation style. But for the record, I'd also like to be your friend. Again, t'was a pleasure. Sometimes I miss going to a new city and needing to make new friends. I've lived here for so long that I've nearly forgotten what thats like. Every time I do it I end up with different results; and thats really nice. Sounds like a fantastic introduction to Sydney, with a barcamp & all. It is a much smaller affair than the Sydney event. If you do make it up this way sometime, I'd be more than happy to show you around. LOL, I don't expect you'll be jetting up to the Gold Coast any time soon... but I should at least provide accurate & useful info. Hi, Pamela! Bruno (Brazilian Flash-designer) here! =) I left you a message on twitter also. Having fun in Syd so far? Lets chat sometime! sccama@gmail.com (Gtalk), sccama@live.com (MSN) and www.sccama.com (my 'a little out dated since I got here in Syd' portfolio). Cheers! Keep an eye out for Web Standards Group meetings, and WebBlast on December 12, the end-of-year party!